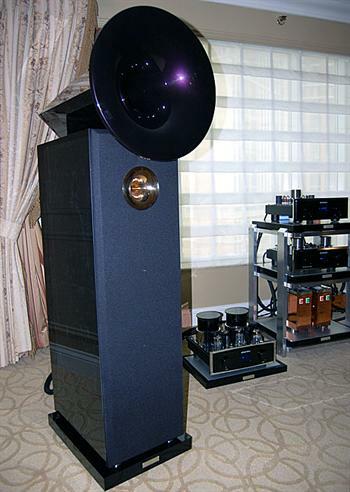 Acapella was showing off their new High Violoncello II loudspeakers ($80,500) using mass-less plasma ion tweeters, with an Einstein front-end consisting of the “The Source" Tube CD player ($18,400), “The Tube MKII” preamp ($18,400) and “The Final Cut MK60” OTL tube mono amplifiers ($34,900 pair). Showing off is certainly what they were doing in this room. It’s tough to argue that there was anything better at CES and these were offering up a live sensation sound that very few rooms could muster. Due to the listening room’s two-level setup, I was advised to sit in the second level with the speakers at the other end of the room. I was happy to comply and was rewarded with considerably better sound. Large speakers need some distance and these were no different. The sound here was highly visceral with the thwack of drums and absolutely pristine top-end response – no hint of glare or other anomalies and huge impact without fatigue. It possessed wonderful inner resolution and decay and didn’t lose sight of overtones. Soundstage was large in all directions with solid, tuneful bass response. And they follow my demands that a speaker must play everything – classical to rock and do it well – these do both exceedingly well and will be happy with a wide array of amplifier choices. The jaw dropping price is justified by jaw dropping sound. Apparently this model is not even close to the top of the line.